The owners of Little Zelda have launched a petition to counter the opposition to the bike corral on Franklin Avenue. You can sign by clicking here. The corral helps support the merchant community up and down Franklin by providing 8 times the parking and beautifies the avenue with two big planters with seasonal plants maintained by the volunteer maintenance partner, Little Zelda (a coffee shop located at 728 Franklin Avenue). The corral also means that bikes no longer have to clutter the sidewalk, chained to street trees and parking signs, as frequently. In the face of some emerging opposition from car drivers who demand the single parking space back, please show your support for a cleaner, greener Franklin Avenue with options for people who drive bikes as well as those who drive cars. The installation happened after discussion & affirmative vote at CB8’s transportation committee meeting, followed by a vote of confidence for the bike corral by the full Community Board 8. You can also send an email with your words of support to littlezeldabk@gmail.com. As seen in your last post, it’s sad that all the opposition comes out after the project has already gone through the appropriate public channels and is complete. Not many people actively participate in their local government, and then it seems they’re angry about it afterwards. 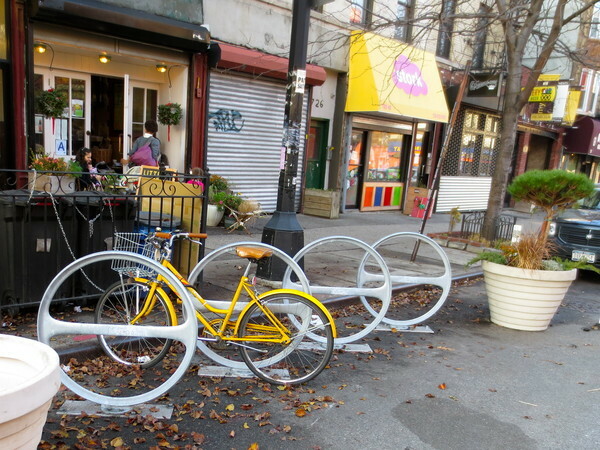 This bike corral looks great, in fact, I was in the city on Saturday, and took my bike along and had an awesome time. These round bike racks are really pleasing, nice too look at, and clearly, with support of the local shops, they’re good for business too!